First of all, thank you everyone for your kind words on my last post. Maybe a cliché, but I now feel, much more than before, a compassion for, and a relation to the people in our world who are suffering and experiencing mindless violence every day of their lives. My heart goes out to all of you. With that said, I will now continue to post on a more regular basis than I have been the previous months. Summertime for me involves such a different way of living than the rest of the year, so I apologize that my blogging has been sparse. I have, however, been sewing. And thinking about sewing. 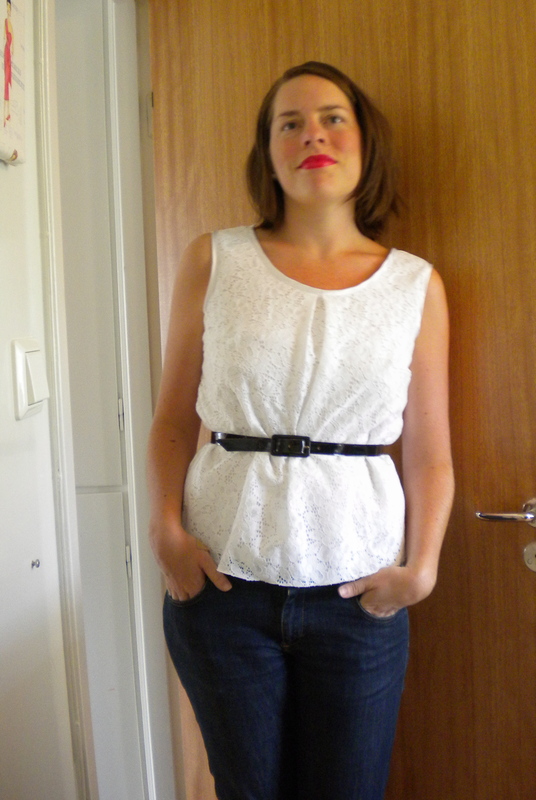 I have made some stuff during the summer, a skirt, some cropped pants, a couple of Sorbetto´s (who haven´t?) and some knit pieces. Eventually, I will show you all of this. But for now you have to settle for pictures of one of my Sorbetto´s. I guess I´ll have to call this Lemon Sorbetto, because this reminds me of all the tasty lemon sorbet I have been eating this summer. Mmmm… For my first version of Sorbetto, I didn´t infact make a FBA, I just went up a size, but for my second version I DID make a FBA, but I forgot to go down a size again, so it is a bit too big. 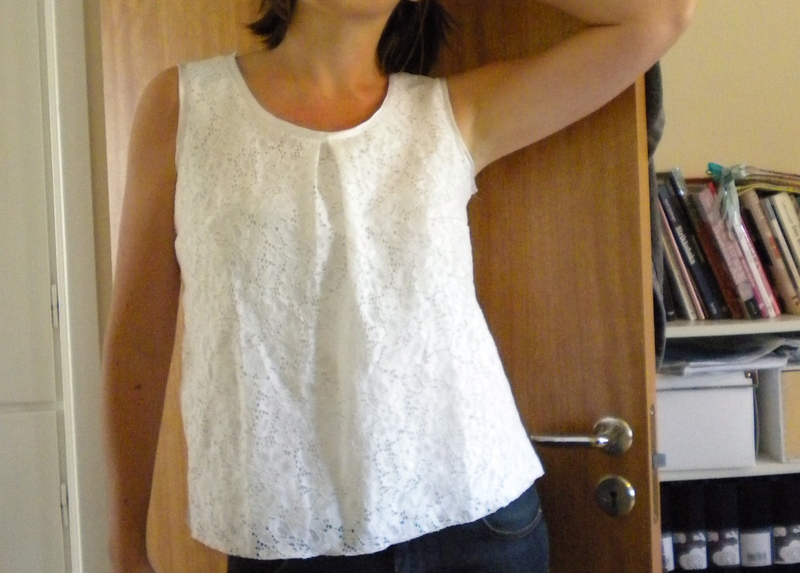 Lesson learned: Always pick pattern size based on your UPPER bust measurement, Sølvi! And then go a head with the FBA. I made it from a lace fabric and a silk/lycra fabric, underlined and stitched together. Both from my stash (yay!). I used french seams in the sides and at the shoulder seams, and then I hemmed by using the rolled seam on my overlocker. So nice to see you blogging again! I like the way you’ve belted your Sorbetto. It gives the garment a really cute shape. LOVE your Sorbetto! Such a lovely summery colour too! Love the inverted pleat Sorbetto! Welcome back!!! @Alessa: it´s Guerlain KissKiss laque in color 720. In case you wondered ;-). I got it as a gift, and unfortunately, Guerlain uses animal testing, so I need to find another, cruelty-free lipstick when this is finished….